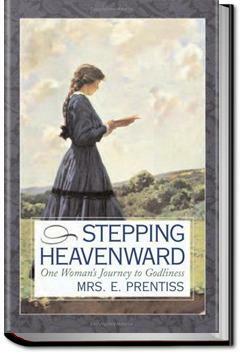 Stepping Heavenward is the journal of a girl named Katherine Mortimer. Katy meets a young man who she loves & wants to marry but her mother is very much against their plans. But Katy’s life goes on through her marriage & motherhood and many tragedies. Her life is a constant struggle to step heavenward. . . .I shall ever care for such books again. Feb. 24.-Mother spoke to me this morning for the fiftieth time, I really believe, about my disorderly habits. I don't think I am careless because I like confusion, but the trouble is I am always in a hurry and a ferment about something. If I want anything, I want it very much, and right away. So if I am looking for a book, or a piece of music, or a pattern, I tumble everything around, and can't stop to put them to rights. I wish I were not so-eager and impatient. But I mean to try to keep my room and my drawers in order, to please mother. Fantastic! I was brought to tears many times. This novel, written in a journal format, shows the sovereignty of God and the peace that comes in submitting to it. It's a beautiful look at a life spent walking with God. Am I really the only one who wasn't a huge fan of this book?? It was okay for a while. But it dragged... and dragged... and dragged. I WAS SO DONE. And it was kind of preachy and JUST NOT MY KIND OF BOOK. Sorry. No, I'm not really sorry. Hard to imagine life in a time when so few children lived past infancy that they weren't named until after toddler ages and were only called "Baby". Written in 1869, this is a fictional journal of a young woman--her beginning, doubts, disobedience, growth, marriage, difficult in-laws, children, and her older days--and is still pertinent to women today.